Having set up home inside the disused Weapon X facility Cyclops decided to rescue Emma Frost from captivity while she was being transported by road from San Francisco. However when Magneto’s power fails Cyclops opens fire, and his optic blasts almost obliterates the military convoy. Now that she is free Emma turns on Scott for leaving her to be captured by the authorities. Realizing that the Phoenix Force has somehow affected their mutations, the former members of the Phoenix Five have to find an away to work together again to realize Scott‘s plan, even though relations between them have never been more strained. Cyclops and his team discover a new Mutant called Benjamin with mimicking powers at a University in Texas, but they are intercepted at the scene by the Original X-Men who have travelled into the future at the behest of seriously ill Beast to try and make Cyclops see reason and bring his Mutant revolution to an end. All New X-Men #5 opens with the confrontation we have been waiting for ever since Bendis and Immonen launched this series, a face off between the original X-Men and Cyclops! The tense standoff is brilliantly played as the Children of the Atom are shocked to see Cyclops standing side by side with Magneto, their sworn enemy, but nothing can quite prepare Jean Grey for the thoughts she picks up from the future version of Scott Summers. This is Brian Michael Bendis as his very best, the telepathic wave of tumultuous emotions and memories from two timelines come together with devastating consequences as Marvel Girl lashes out in disgust telekinetically when she realizes what Scott’s future self has done, dislodging Cyclops visor and inadvertently unleashing his optic blasts. The two Cyclops face each other, optic blasts locked in combat, but Scott’s younger self is unable to withstand the onslaught. 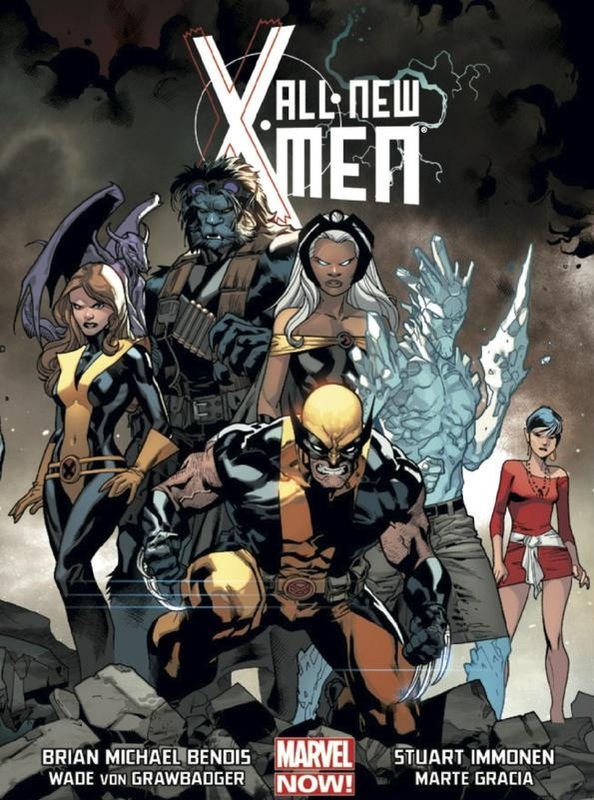 As both men struggle to recover, Magneto calls for Magik’s help, attacking Iceman before Illyana teleports them to Weapon X where they have hidden two new Mutants: the Australian time manipulator Eva Bell and the healer from Michigan – Christopher Muse. While Emma Frost contemplates the reasons behind the young X-Men’s return, the Original Team takes the Blackbird back to The Jean Grey School for Higher Learning and find Kitty Pryde and Iceman keeping vigil over the Beast as they try to contact Reed Richards for help. But when they are unable to contact him Hank McCoy’s condition suddenly deteriorates and he suffers a cardiac arrest! Every page of Stuart Immonen’s incredible artwork makes Bendis’ story flow as seamlessly as its mind-bending time travel concept. The big action set-pieces are superbly inked by Wade Von Grawbadger, with every scene beautifully enhanced by Marte Gracia’s colours. All New X-Men #4 is bursting at the temporal seams with standout moments: Jean Grey’s horror at reliving the murder of Professor X in Scott’s mind is almost palpable, as is Jean’s struggle to block out the concerned thoughts of her team mates when they rest on a flat top mountain in Colorado, but it is Emma Frost’s estranged relationship with Scott that suffers the most as spectre of Jean Grey looms large in their lives once more. Brian Michael Bendis still has a lot of fun with the time travel concepts, offering up a brilliant scene where Kitty blames Iceman for giving Beast the idea of “letting Summers see what he has become” and inadvertently setting in motion one of the greatest paradoxes the Marvel Universe has ever known. It’s really funny how Bobby reacts to his younger self, always screaming whenever he walks into at room, unnerved by the fact that continually finds himself looking at himself. There is also a priceless moment when the Original X-Men return to the School in the stolen Blackbird and brusquely take charge of the situation and race to hep The Beast, completely ignoring Storm and Wolverine along with their simultaneous declaration of authority. All New X-Men #4 is by far one of the best Marvel Now titles around. Bendis and Immonen have crafted an ingeniously fan pleasing storyline that has injected a wealth of new possibilities to quickly become something very special indeed. Today the BBC released the latest image of the new TARDIS interior that will debut in the Doctor Who Christmas special: The Snowmen. After a week of teasing images and a fantastic prequel episode featuring Madame Vastra, Jenny, and Strax, we have finally been treated to a preview of the brand new TARDIS interior created by Doctor Who production designer Michael Pickwoad. The new design is fantastic, and Matt Smith looks really pleased with his new Console Room. I think it really captures the look and feel of the Classic Series! It seems there are even more surprises in store for us in The Doctor Who Christmas Special this year. As well as featuring the debut of Jenna Louise Coleman as Clara, and a stunning new TARDIS interior, The Snowmen will also see the premier of a new title sequence and revamped theme tune! So get ready to enjoy the new theme tune and opening title sequence when you watch The Snowmen on BBC One, Christmas Day at 5.15pm. Snared in a web of chattering joker teeth at Gotham’s reservoir, Batman struggles furiously against his bonds as The Joker gleefully celebrates his victory by announcing how he knows who Batman and his friends really are. When the Police arrive Joker’s goons fire RPG’s at Bullock and his men, destroying the roadblock and taking out the Police helicopter which then crashes into the reservoir. Batman breaks free, launching himself through the flames to attack the Joker, beating him and demanding to know what he has done with Alfred Pennyworth. But in his haste to get free, Batman lost his gauntlets, inadvertently allowing his exposed fists to be contaminated with a paralysing Joker toxin when he punched The Joker. Overwhelmed by the toxin, Joker sends Batman tumbling into the water, promising that nothing will stand in the way of the ominous celebration he has planned for The Dark Knight and his allies. Scott Snyder and Greg Capullo take Batman #15 to new heights as Death of the Family moves into even darker territory than we thought possible. The opening and closing monologue from Batman himself bookends this frightening tale as The Dark Knight begins to peel away the nightmarish layers of The Joker’s plan, knowing that he must soon peer into Joker’s unblinking eyes and realize his own inner demons if he is to have any chance of saving Alfred from this madman. One of the standout moments this issue comes when Snyder and Capullo masterfully delve into the enigma of the Joker’s twisted mindset. In a bid to convince them that the Joker was lying about knowing their secret identities, and his reasons for not telling them about Alfred’s kidnapping, Bruce recounts a story where he found The Joker’s “calling card” on the hull of the Batboat after Joker attempted to gas Gotham City and mysteriously vanished when he fell into the bay. A replica of that card has hung in the Batcave for years now, and as they stand before it, Batman’s friends are shocked to think that The Joker might actually have managed to cling to the Batboat after it submerged to make into the Cave. Although Batman is adamant this would be an impossible feat, even for him, it illustrates just how deeply engrained The Joker’s twisted games have become on Batman’s mind – and how much the rest of the Bat-Family still have to learn about Gotham Cities greatest menace. Batman #15 brings last issues heart-stopping cliff hanger to an explosive end before slowly tapping the rich vein of horror that Snyder has continued to build on since The Joker’s return. Even the brief description of what Joker has been up to at Arkham is enough to make your blood run cold, as is the assumption that Batman has actually seen something in The Joker’s eyes before – something so horrible and unnerving that even Batman has to take a moment of contemplation before entering Arkham Asylum..
Red Light Green Light is another superb back up story by Snyder, Tynion IV, and Jock that gives us a further insight into Joker’s plans for Arkham Asylum when he enlists the help of The Riddler to complete his mad scheme. Joker needs Riddler to help him create a very special surprise for Batman, having drawn inspiration from Jeremiha Arkham’s Doctoral Diploma, something which even The Riddler cannot fully begin to comprehend as The Joker leads him away. Batman #15 is another fantastic issue by Snyder and Capullo. Death of the Family continues to deliver on all fronts, and I’ve enjoyed every macabre and twisted moment. Having taken his first tribute from Alexandra and humiliated Rick in front of his friends, Negan and his men drive away with their spoils. Determined to get revenge, Carl secretly hides in the truck and gets a ride all the way back to the Saviors camp. Once they are inside the heavily fortified perimeter of the compound, Carl leaps from the truck and opens fire with an assault rifle, killing some of Negan’s men before he is overpowered by Dwight and brought before Negan. 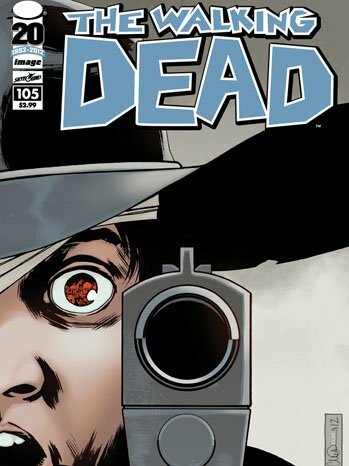 The Walking Dead #105 sees Robert Kirckman and Charlie Adlard place Carl right in the heart of enemy territory, leaving us on the edge of our seat as Negan casually takes the boy under his wing and shows him around. We get to see another, even darker side to Negan as we witness the almost fanatical devotion of his followers, who seem willing to submit to his oppressive regime in return for food and shelter from the Walkers. 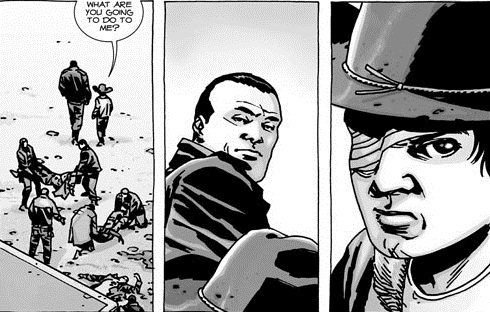 Negan introduces Carl to his harem of wives before finally being left alone in the tyrant’s private quarters. What follows is both horrifying and tragic as Negan bullies Carl into removing his bandages to reveal the gaping wound where his right eye used to be, reducing Carl to tears as he callously admires the gory wound of ragged flesh and bone. Negan seems to enjoy threatening his trembling captive, goading and taunting him, before making Carl sing a song while he practices some killing moves with his prized baseball bat Lucille (the deadly weapon he used to beat Glen to death with). With this scene Robert Kirckman shows just why The Walking Dead is the leader of the pack with its uncompromising vision of the Zombie Apocalypse. This brief moment is really unsettling, particularly when Carl breaks down after Negan forces him to confront the reality of his injuries. This series is never afraid to give its characters room to grow and evolve, even though the pace may seem to slow dramatically while the main characters are effectively sidelined for an issue, it is these quiet interludes that make The Walking Dead so riveting. This issue may be devoid of Zombie action, but Charlie Adlard still captures our attention with ever panel as we follow Carl’s progress through this industrial nightmare. If the scenes between Negan and Carl weren’t unpleasant enough, what follows is a lesson in just how tight a grip Negan has over his followers. On learning that one of his wives, Amber, has “cheated” on him with her former partner, Negan exacts a terrible punishment on the man. To be chosen as one of Negan’s wives is deemed a privilege, one that will ensure the woman no longer has to earn points to trade for goods inside the camp. However, if she is ever caught with another man, that man must then be punished with a molten hot iron and have the flesh seared from one side of his face so that everyone will always know the shame of what he has done. As Negan brands the offender before a baying mob, a knowing glance between Dwight and another of Negan’s wives seems to indicate the reasons behind Dwight’s horrible scars. With a wealth of unspoken history between Negan and Dwight conveyed in a single panel, The Walking Dead #105 continues to play with all our expectations, and as Negan leads Carl away to face an uncertain fate we are left wondering how on earth he is going to escape this hellhole alive. In the aftermath of Solomon Grundy’s defeat Alan Scott’s global media empire GBC is covering every aspect of recent events as news reports begin to emerge about the new wonders of Earth 2 and the heroic part they played in saving the world. Although the headlines state that Alan Scott was not one of the victims of the train crash in China, the claims that he is fine and well are far from the truth. Alan Scott is consumed with grief over Sam’s death, smashing up his penthouse in a furious rage, before Hawkgirl arrives on the balcony with a renewed request for him to join with her and the Flash to work together as a team. When he refuses Kendra attacks him, forcing him to put on his power ring again, but before he can retaliate she vanishes. While Alan Scott ponders his future, over in The World Army Central HQ in Tokyo, Commander Khan is summoned to a meeting before the members of The World Army Council. Khan is aghast when the Council appoint Terry Sloan to be the new Head of The World Army Science Directive. He may be forced to work with Terry Sloan for now, but having secretly uncovered one of Sloan’s secret bases in Paris, Khan has sent Colonel Dodds and his Sandmen to investigate the building where they find a lab guarded by Sloan’s brainwashed prisoner from Earth 1 – Mr Terrific. After subduing Mr Terrific and trashing the lab, Colonel Dodds reports back to Khan with his findings. Although Khan and Dodd are uncertain why Terry Sloan captured Mr Terrific when he mysteriously appeared in Manhattan, they are sure he is the key to Sloan’s plan. Yet as they covertly decide to deprogram Mr Terrific it may already be too late, Terry Sloan has quickly gained the trust of The World Army Council, and soon all the secrets of The World Army and its facilities will be his to govern and implement as he sees fit. James Robinson seamlessly shifts the tone of Earth 2 from the all-out-action against Solomon Grundy with a somewhat reflective 7th issue that not only deals with the global recovery in the wake of recent events, but also sees the heroes of Earth 2 gradually coming to terms with the implications their new powers will have on their lives. Robinson addresses the reasons behind Green Lantern’s arrogant dismissal of The Flash’s idea of banding together to form a new team of wonders, revealing how a grief stricken Alan Scott cannot even bear to look at his power ring, let alone consider using it to help form a new team of superheroes. Having trashed his penthouse in a furious rage, Alan is surprised to get a visit from Hawkgirl who once again tries to persuade him to join her and Flash as part of a new team. This issue really throws the spotlight on Hawkgirl as she talks to Alan on the balcony of his penthouse: even going so far as to reveal her full name, Kendra Munoz-Saunders, one time Archaeologist turned Tomb Robber, whose skills brought her to the attention of The World Army where on a subsequent mission she acquired her wings. 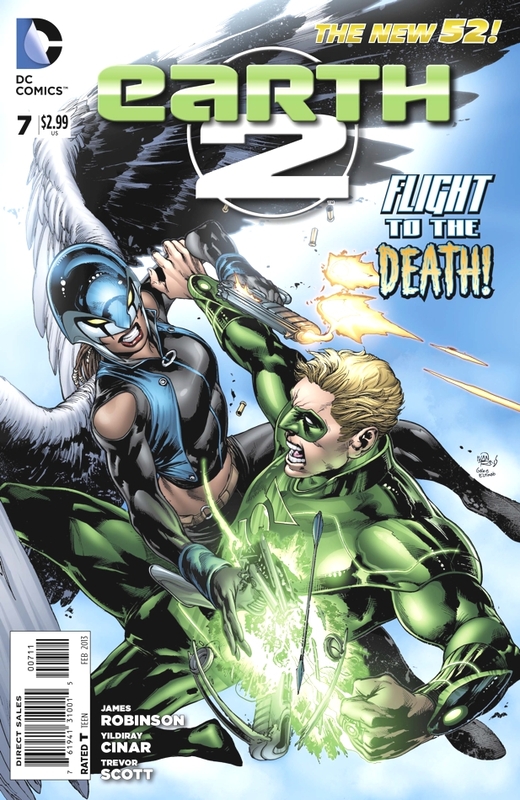 Feeling trapped and persecuted by society, Kendra tried to distance herself from The World Army, however, fighting alongside the new wonders in Washington against Grundy – as well as the prophecy that an even greater threat is coming – has made her realize that Earth 2 needs its heroes now more than ever. As if to illustrate her point, she forces him face up to his grief by demonstrating how vulnerable he is. Kendra fires her crossbow when Green Lantern turns his back on her, shattering a photograph of Sam which enrages Alan enough to instinctively draw the power ring to him, but as he turns to face her Hawkgirl is gone. Confrontations come thick and fast this issue, the air positively crackles with tension as the scene shifts to Commander Khan and Terry Sloan at The World Army HQ in Japan where Sloan has been placed in charge of The World Army Science Directive. While Khan does little to hide his disgust of what he describes as the “obscenity” of Sloan’s placement, he agrees to work with him in principle – at least for now. Having dispatched Colonel Dodds and his elite squad of Sandmen to break into Sloan’s secret lab in Paris, Khan is intrigued when Dodds reports how they discovered a deranged prisoner from Earth 1- Mr Terrific – and brought him in for questioning. We still have no real clue about how Mr Terrific fits into Sloan’s schemes but it will be interesting to see how James Robinson develops the fearful symmetry between these two hyper-intellects. As well as a welcome return of Colonel Dodds and the Sandmen Earth 2 #7 continues to entice us with snippets of dialogue that offer the promise of even more wonders to come. It is clear that The World Army has vast resources at its disposal. After the horrors of the Apokolips War the World Army Council has been working on a number of top secret programmes in a bid to research and replicate a new age of wonders. Khan realizes just how dangerous it is to allow Sloan access to this data, but is powerless to prevent the Council giving Sloan free reign to initiate his own interpretation of The Wonders Protocol and Project: Biohive. While we are teased with another mention of Captain Steel regular readers are rewarded by the appearance of The Red Tornado! Terry Sloan has decided to transfer the feminine robot still under construction to the Wonders Imitative Facility in Portland. Here’s hoping it won’t be long before we get to see this new Red Tornado in action. This issue features the debut of guest artist Yildiray Cinar (The Fury of Firestorm the Nuclear Men; Teen Titans) as he joins Earth 2 for issues #7-8. This will also be Cinar’s debut collaboration with James Robinson. Fan favourite Yildiray Cinar is a perfect choice to illustrate Earth 2, his dynamic flair leaps from every scene and is perfectly complemented by Trevor Scott’s inks. Although Earth 2 #7 is comparatively light on super powered action, Cinar and Scott lavishly depict the global recovery from The Rot, allowing the characters and their conflicts time to play out against the stunning backdrops of high tech military instillations and panoramic city skylines. The focus on quieter moments of reflection is tempered by the conspiracy and betrayal beginning to form at the very heart of The World Army. Earth 2 continues to astound and impress on all levels, with the imminent return of Steppenwolf and the introduction of this parallel worlds last Amazon, I have a feeling that we have only just begun to scratch the surface of all the wondrous characters and storylines Earth 2 has to offer. Having travelled back in time Hank McCoy persuades the Original X-Men to return with him to the future, hoping they will be able to prevent Cyclops from bringing about a Mutant Apocalypse that could engulf them all. The young X-Men emerge from the Time Cube in front of The Jean Grey School for Higher Learning to be confronted with a with their future selves. Unable to hide the pain of his Next-Generation Mutation any longer, The Beast collapses and is taken to the infirmary. While the X-Men look after Hank, the young members of the original X-Men are left to marvel at the changes to the school and their discoveries about the future. After Jean telepathically subdues Wolverine they see a news report about Cyclops on TV and decide to carry out their mission anyway, ignoring the possible dangers their intervention might cause to the space-time continuum, and stealing a Black Bird before jetting off to confront Cyclops. All New X-Men #2 sees Brian Michael Bendis on top form as the Original X-Men take their first tentative steps into the future. This is a fun issue that will leave X-Men fans with a big silly smile on their face as they watch the original team interacting with the strange new world they find themselves in. One of the most hilarious moments is when Iceman comes face to face with himself, and the ease at which the young Jean Grey sends Logan to sleep when he’s lecturing them is priceless! The humour is skilfully handled by Bendis, it never detracts form the plot, and some of the best moments come when Hank is trying to get the original team to come back with him to the future. Here the comedy is tempered with some genuinely touching scenes, particularly when Hank inadvertently reveals Jean will be able to read minds, then later when he tells them how Cyclops has already killed Professor X in the future. It’s also surprising just how quickly these “little” X-Men (as Wolverine labels them) begin to adapt to their surrounding. Their training may be rough around the edges, but they easily take out Wolverine when he attacks them when they arrive outside the school – presumably because he detected Scott’s scent and thought the school was under attack. They also cope well with their new foreknowledge: Jean seems positively flippant about being dead in the future and dating a homicidal mutant terrorist, Hank McCoy steps in to help treat his fuzzy future self, Scott is determined to uphold Xavier’s dream, while Bobby enjoys the novelty of widescreen TV, only Warren seems to be uncomfortable and suggests that maybe they should return to their own time. Stuart Immonen’s art is astounding, every scene bursts with detail and energy, perfectly realizing the different generations of the X-Men and striking just the right balance between the humour and some key emotional beats. 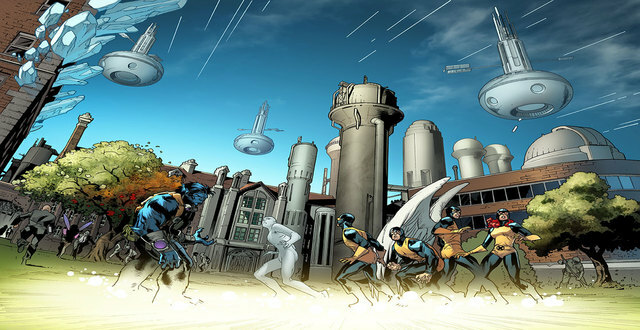 The youthful exuberance and innocence of the original X-Men is like a breath of fresh air as they breeze into the present, a scene that is encapsulated brilliantly in a stunning two page spread by Immonen when the young X-Men materialize outside the school and look up in awe at the wondrous things the future has in store for them. Two issues in and I’m hooked. All New X-Men has a brilliant premise, one that I’m sure Bendis and Immonen have only just begun to explore. 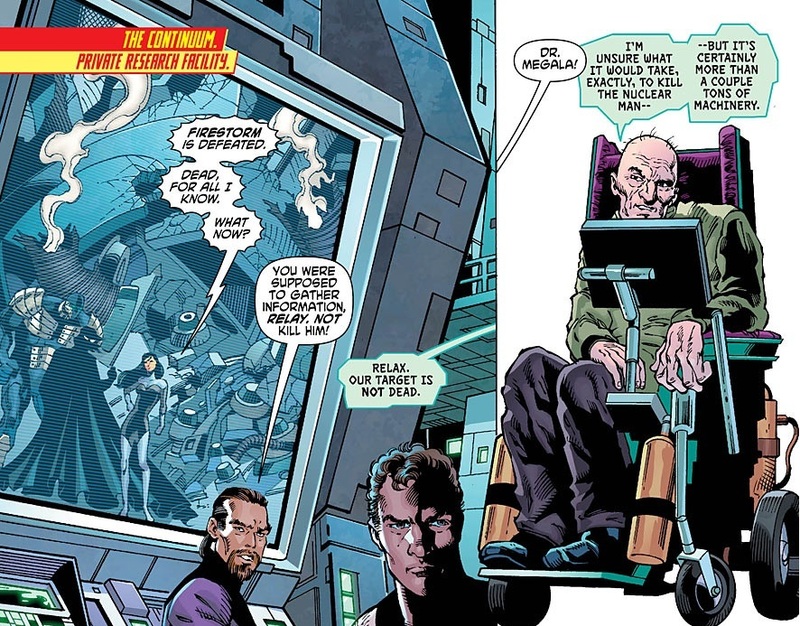 The time travel elements, if you consider the catastrophic paradoxes that could result from the X-Men crossing over their own time lines, are a little hard to get your head around. Hell, you’d probably go and lock yourself in Hank McCoy’s lab and never come out if you think about it too much! All New X-Men #2 is fantastic fun and one of the best Marvel Now titles I have had the pleasure to read so far. 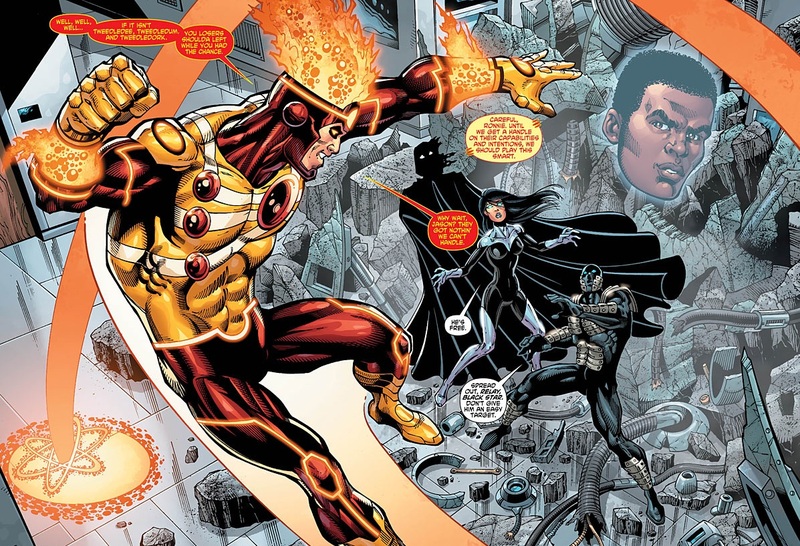 After investigating a break in at the S.T.A.R Quantum Physics Lab, Firestorm is attacked by a new team of super powered criminals, but he quickly recovers and begins to fight back against Relay, Skull Crusher, and Black Star. Firestorm uses his power to transmute matter to quickly neutralizes Black Star and Skull Crusher, unaware his abilities are being monitored by the horribly crippled Dr Megala back at The Continuum underground research facility. Dr Megala orders Relay to use her telepathic powers to scan Firestorm and she senses that he is actually two being in one body – detecting Ronnie and Jason’s separate personalities. Before she can learn too much, Firestorm knocks her out, but not before Dr Megala activates the labs quantum field. Firestorm is left in agony as the machinery disrupts his structural integrity, it feels like they are being torn apart, in sheer desperation Jason instructs Ronnie to unleash the strongest burst of explosive energy he can. Firestorm lets rip, destroying the equipment, and blasts his way out of the building. As they return home and transform back into their civilian identities, Firestorm vanishes from Dr Megala’s sensors. Dr Megala has been monitoring the multiple sightings of the various other Firestorms around the world for some time now, although he is uncertain why they have all suddenly disappeared, Megala is determined to study this Firestorm in the hope that he might replicate the brief instance when Captain Atom freed him from the limitations of his disease ridden body to soar amongst the stars. The next day at High School it seem like the effects of the battle have yet to wear off, Ronnie and Jason are still exhausted and in pain. Luckily for Ronnie, he doesn’t have to worry too much as Tonya has finished his History Paper for him, something which causes Jason to react angrily over Ronnie’s flippant attitude towards his studies. Later, when Jason goes home, he walks in on his dad arranging a date over the phone with Ronnie’s mother – Joanne. Before he can even begin to deal with this news, Jason doubles up in agony. As his father tries to help, Ronnie arrives, having also been affected by painful spasms. They turn into Firestorm and fly off to try and find out what is happening to them, but as Jason tells Ronnie about Al and Joanne they are suddenly attacked by the giant robot Daxaxen. 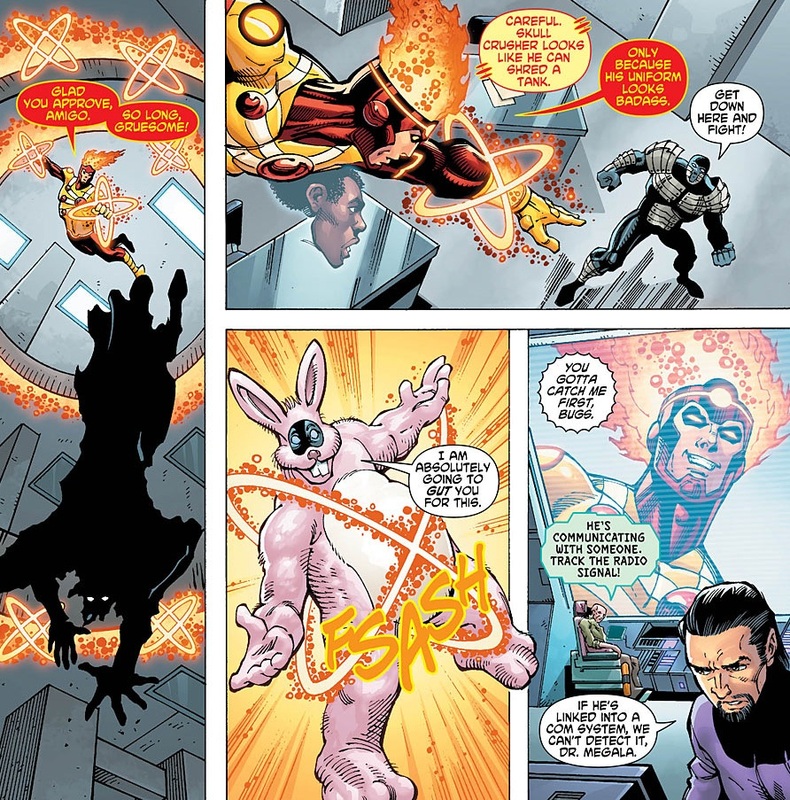 In his weakened state Firestorm is unable to put up much of a fight, and the robot easily snares him using cables infused with quantum energy that cancel out his powers. Firestorm is helpless to avoid being drawn inside Daxaxen, once he is imprisoned Dr Megala initiates the transfer device he has constructed, and after a blinding flash of energy the crippled scientist transplants his mind into Firestorm’s and takes over his body. While Dr Megala relishes his stolen bodies incredible powers, General Eiling assesses the damage at the lab, but before he can investigate further he receives an unexpected is visit from Captain Atom! The Fury of Firestorm the Nuclear Man #14 continues to expand on writer/artist Dan Jurgens brand new direction for the series. It’s great to see just how quickly Ronnie and Jason are adapting to their shared existence as Firestorm. In combat their combined abilities are enhanced by their different personalities: while Jason calmly transmutes the floor beneath Black Star to gas, Ronnie hilariously changes Skull Crusher’s armoured form into a giant bunny suit, an equally blunt approach stops Relay from scanning their minds, but in the end they selflessly rely on teamwork to escape from the lab when the quantum field begins to tear them apart. Back in their everyday lives at High School tensions are beginning to rise between the two friends as Ronnie’s indifferent attitude towards his studies being to annoy Jason, especially as Ronnie had to rely on Tonya to complete a paper for him, and its becoming clear that Jason is starting to feel jealous about Ronnie is spending time with Tonya. This is further compounded when Jason finds out his dad is dating Ronnie’s mother, although Ronnie and Jason don’t have much time to digests this news before they have to rush into action as Firestorm again. It’s also nice to see Captain Atom return from the abyss of cancellation; his title was one of The New 52’s most innovative yet, and the character seems like a natural choice to guest star in Firestorm. 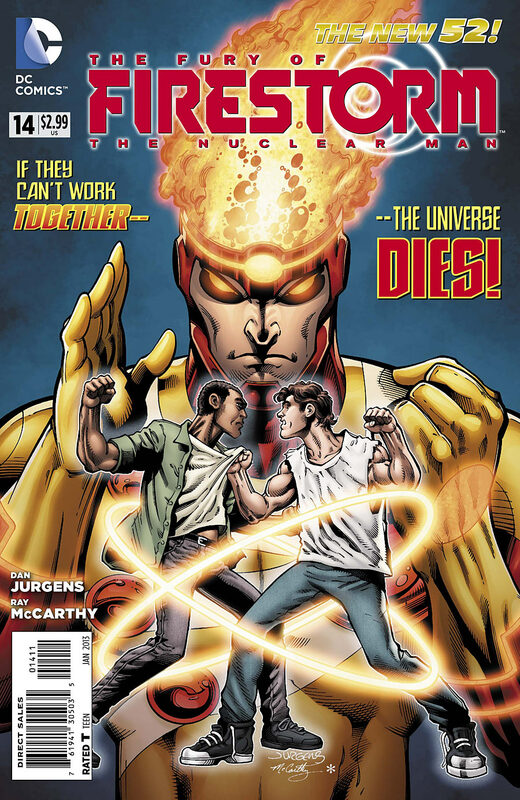 After the events of Captain Atom #11 its not surprising that Dr Megala wants to escape his twisted body again. Although the body swap idea is nothing new, it is given a nice twist here as Firestorm himself is a combined being, so it will be interesting to find out what has happened to Ronnie and Jason now that Megala has taken over their body. Dan Jurgens art on Firestorm #14 is inked by Ray McCarthy and vibrantly coloured by Hi-Fi, together they make a great team, bringing as much depth and substance to the more domestic aspects of the book as they do the big action sequences with Firestorm. The Fury of Firestorm #14 is another fantastic issue in this new series, everything feels fresh and exciting and I can’t wait to see how Ronnie and Jason cope with being taken over by Dr Megala.